Android Marshmallow continues to roll out to a wide range of devices with even more expected in this quarter but to suggest the adoption is setting the world alight would be an great overstatement. In their latest report on Android versions that have hit the Google Play Store, Google has posted that devices running the latest version of the mobile OS accounts for 0.7%. While that is up .2% from December, it is a far cry from rapid adoption. Worse, Android Lollipop, the previous version, continues to hold steady with about 32% of the market. While the information is not 100% accurate, it does give developers a good idea of users who are coming to the store which in turn gives us as users a good idea too. 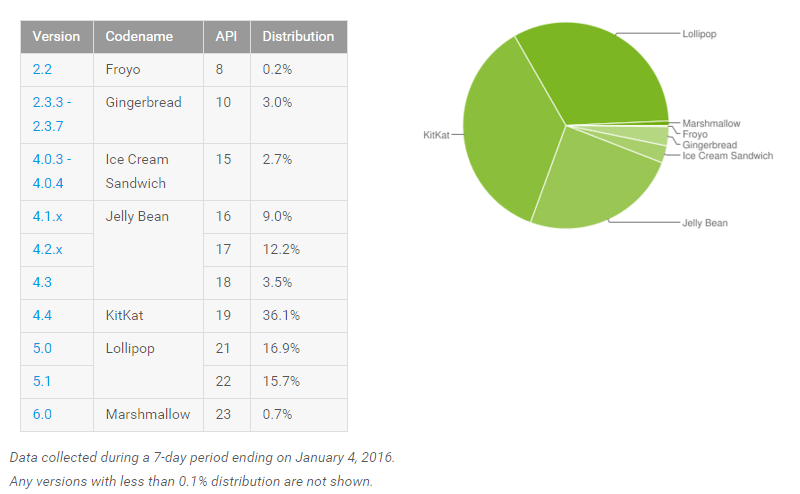 By far the two most dominant version of Android remain Lollipop at 32.6% and KitKat at 36.1%. KitKat has seen a slow drop in usage as more people move to newer devices with a newer version of Android but it gives you a good idea of the challenge Google faces in getting consumers and manufactures to move up to the latest version of their mobile OS. with features like Doze and requiring device encryption, OEMs are simply not willing to play ball. If that is really the reason, it’s a shame because ultimately the consumer (you and me) lose out the most by having outdated and not as secure operating systems on our devices. It is certainly an area which Google needs to take more control. While Google and manufactures are to blame for some of this, carriers are part of the problem too. The Nexus 6 for example, has been updated to Android Marshmallow 6.0.1 by Google (for unlocked) and by T-Mobile for devices on their network. AT&T meanwhile has yet to release the 6.0 update to their customers and there is no indication of when or if they will do so. That puts users with last year’s flagship Nexus device a revision behind for no reason other than AT&T not being willing or wanting to do the update. It will be interesting to see how Marshmallow does over the course of this quarter given more manufactures are updating existing devices and releasing new ones with the latest version of Android. Hopefully we will see a nice spike soon but I’m pessimistic until carriers and other manufactures are forced to deal with upgrades by Google themselves.